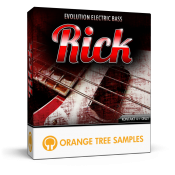 Orange Tree Samples is proud to present Evolution Electric Bass - Rick, a deeply-sampled electric bass guitar sample library. At its core, Evolution Electric Bass - Rick consists of extensive samples complemented by a powerful script. These two facets work in unison to give you ultra-realistic bass sounds with minimal effort.